About a year ago, my wife purchased two relatively expensive, high-quality, cheese graters from Microplane…a manufacturer that sells a wide variety of kitchen tools. Shortly after purchase, the box grater broke. More recently, the hand grater broke, much to her dismay. Understandably so, my wife was a little bit upset. Given the cost of the product, she expected it to last much longer then a year or so. After licking her wounds, she went onto the company website and reached out to them via email. Her email simply asked if there was anything that could be done about her broken cheese grater, and despite sending the message right around the holidays, she was surprised when they responded almost immediately. The employee indicated that they were out of the office for the holidays, but wanted to get back to her quickly. The employee asked if my wife could send a photo of the broken items, so that she makes sure she is replacing the correct product, and that she would take care of it upon her return from vacation. By the end of the first week in January, my wife had replacements for both graters. Not only, did they send brand new replacements, but the box grater was upgraded to their newest model! Based on this experience, it is clear that Microplane stands behind their products. They truly value their customers and provide fast, friendly customer service. Finally, they certainly exceeded my wife’s expectations, both in terms of getting back to her over the holiday season and by sending more than just the replacement product. Many years ago, when all of my friends started to get married, the bulk of them registered at Cayne’s The Super Houseware Store. 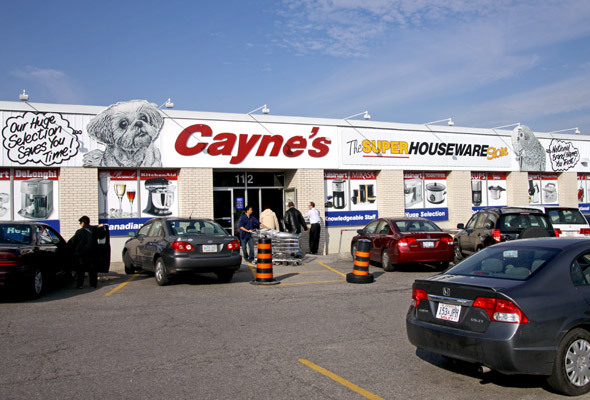 Cayne’s is located on Doncaster Avenue in Thornhill, and is known for selling high quality kitchen appliances and many other houseware items at the best possible prices. Aside from providing the lowest price (at Cayne’s you never have to price match since the prices are already rock bottom), Cayne’s is also known for variety of other reasons, including: having extremely helpful and knowledgeable sales associates working on the sales floor, supplying a large product selection, offering extended warranties to customers and stocking replacement parts of the items they sell. All of this creates a recipe to ensure happy and loyal customers. At Cayne’s it is always easy to find a sales associate to help you while browsing through the store’s aisles. Don, is one of the managers in the store, and is an excellent source of knowledge. He has been working there for as long as I can remember and aside from knowing all of the products Cayne’s sells, he is very familiar with competing products available on the market. After speaking with Don I can guarantee that you will be able to make an informed decision on the best product for your household. Another wonderful thing about Cayne’s is they stand behind the products they sell. Cayne’s has taken it upon themselves, to include longer warranties (no additional costs), on many products which they sell, beyond the time frame given by the manufacturer. In fact, on occasion, and depending on the circumstances, they have even accepted defective products after both warranties have passed. Cayne’s believes in all the products they sell and wants to make things right for all of their customers. Whether you are looking for a gift or something for your home, Cayne’s is a great place to check out.